1. Object – Any Standard/Custom Object for which you want to create an Approval Process. 2. Criteria – Any condition/rule that execute this Approval Process. 3. Approver – Name of any person (employee, Manager user etc.) to whom send this Approval Process. 4. Action – Actions that are performed when approval process starts/executes. a) Initial Submission Actions: Actions performed on Submission of Approval Process. b) Approval Actions: Actions performed when approver approves the process. c) Rejection Actions: Actions performed when approver rejects the process. d) Recall Actions: Actions performed when the Submitter recalls the approval process. A. 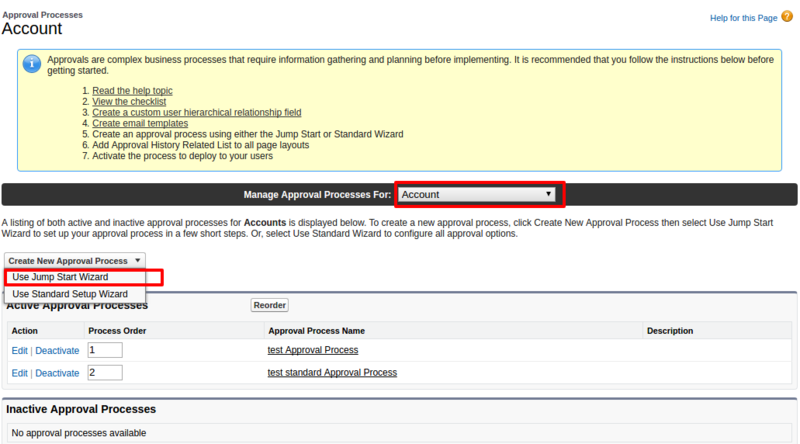 Use Jump Start Wizard: It is a few step process as many of the configurations are automatically handled by Salesforce. B. Use Standard Setup Wizard: It is a lengthy process. By using this Wizard, one can configure the whole process manually. Suppose I’ve selected an Account Object and select Use Jump Start Wizard. 2. After selecting the Object and Approval Process Wizard, following window will open. a. 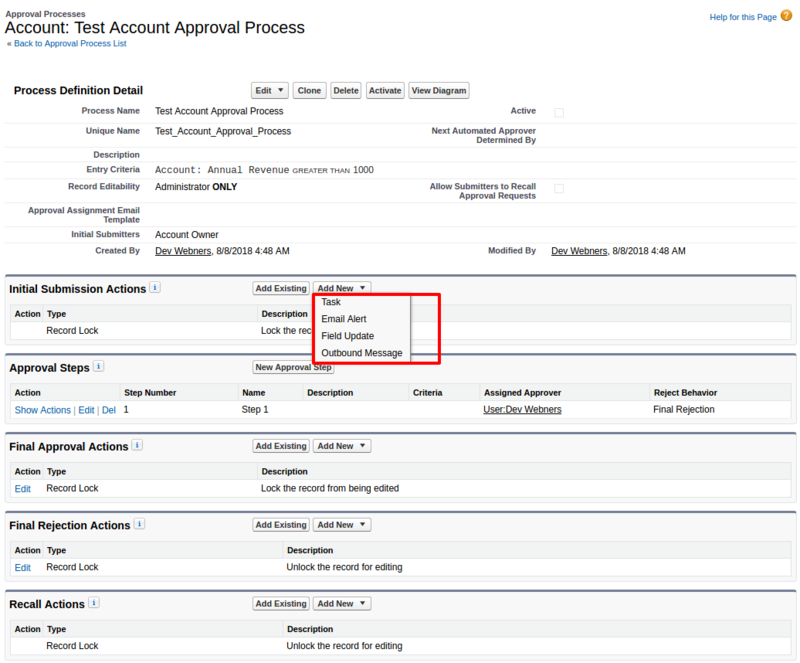 Fill the Name of Approval Process:- I’ve added this name “Test Account Approval Process” . b. Enter Criteria:- I’ve added the criteria that is when an Annual Revenue field value is greater than 1000. This approval process will execute only if it matches the Criteria. Click on Save button to save the approval process. d. Open Approval Process detailed Page as shown below. You can add different actions for different Stages (Initial Submission, Approval, Rejection etc.) of the Approval Process. It is a single step approval process. We can add more approval steps to create a multi-step approval process. For example: I’ve selected the Field Update action. Suppose I’ve already created one Custom Picklist “Approval Status” field (Pending, Approved, Rejected, Recall) in Account Object. You can select the field that you want to update and add value for that field. 1. 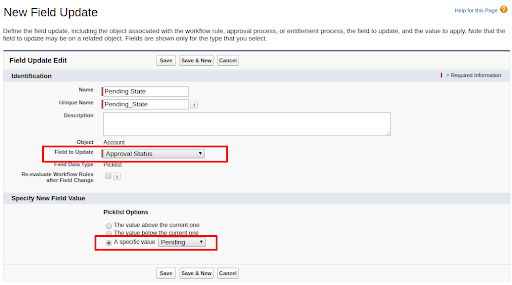 Initial Submission: When submit this Approval Process, Update the Approval Status picklist value to Pending. 2. Approval: When approver approve this approval process, Update the Approval Status picklist value to Approved. 3. Rejection: When approver reject this approval process, Update the Approval Status picklist value to Rejected. 4. Recall: When submitter recall the approval process, Update the Approval Status picklist value to Recall. 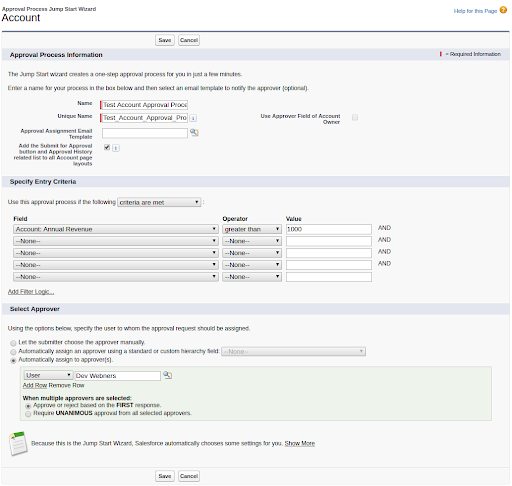 Record of selected object will be locked (cannot be editable) after submitting the approval process. If you want to edit this record, then recall this approval process and edit the record and then again submit the approval process. After creating the approval process, Click on Activate button on detail page of Approval Process to activate this process.